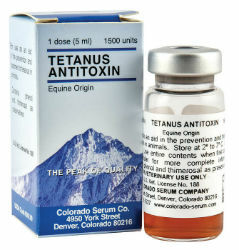 Administration of Tetanus Antitoxin is recommended for use whenever a non-immunized animal, or one whose immune status is unknown, suffers a deep penetrating wound that has or may become contaminated with soil. It provides quick but short-term protection. Antitoxin may also be administered to animals following castration, docking, and other operations performed on premises upon which tetanus infection has been a problem. Provides immediate passive immunity that lasts 7-14 days. NOTE: Vaccination with tetanus toxoid is recommended for healthy domestic animals not infected with tetanus, to establish an active immunity for prevention against disease. Consult with a veterinarian for specific vaccination recommendations. Sheep and swine: give 5,000-12,500 units. Colorado serum recommends using one 1,500 unit vial per goat regardless of size/age for prevention and higher levels (3x and higher) for treatment.